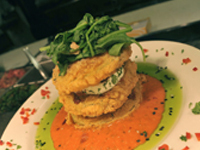 A good deal of fresh food that finds its way onto Hilton Head Island’s menus originate here, so it’s no surprise that there’s spectacular dining for breakfast, lunch, and dinner. 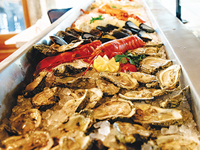 On Hilton Head Island, enjoy casual fare, elegant dining, fresh seafood and international cuisine. You’ll find outstanding restaurants offering signature Island recipes, on the Island the dining world is your oyster. Bon appetit! For over 25 years, Main Street Village has become a favorite place to dine, shop, and stroll on Hilton Head Island. Trip Advisor’s top three dining spots on the Island are located here as well as some of the choicest and most unique shopping boutiques. 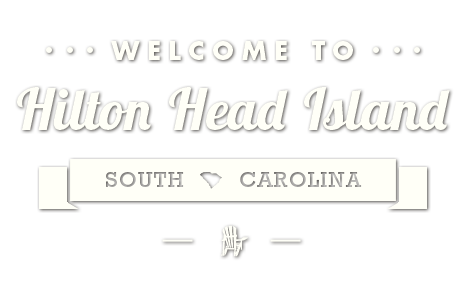 Main Street Village is located at the entrance of Hilton Head Plantation on the North end of the Island. 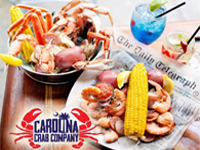 Pet-friendly, Carolina Crab Company offers an array of fresh seafood, burgers, prime rib, lobster and crab legs. Open seven days a week from 11:30 a.m. with brunch served Saturday and Sunday. Simply the best steaks on Hilton Head! 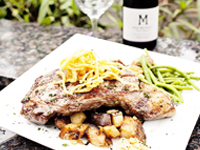 Crane’s Tavern, only the best Prime Beef is served and a carefully crafted wine list is offered to the customers. We are a recipient of Wine Spectator’s Award of Excellence. Also featuring Fresh Seafood, fish, Poultry and Pasta. “Over 100 Years of Family Tradition.” We hope you will join us. 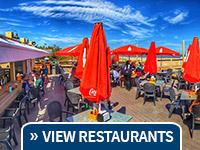 From freshly brewed coffee and sinful cinnamon rolls to southern fried chicken, local fish tacos, finger-lickin’ good BBQ and more – Palmetto Dunes Oceanfront Resort has exactly what you’re looking for. 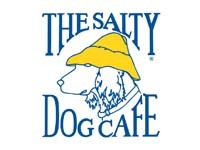 Dine at Big Jim’s BBQ, Burgers and Pizza, beachfront at The Dunes House, the Palmetto Dunes General Store or at any of the six waterfront restaurants at Shelter Cove Harbour & Marina for a fantastic Hilton Head Island culinary experience. Call 888-322-9091 or visit www.PalmettoDunes.com/dining. Enjoy the famous steamed shrimp, frozen drinks, casual atmosphere, great food and live entertainment at the Island’s favorite outdoor café overlooking beautiful Braddock’s Cove at South Beach Marina. 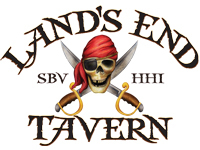 Serving lunch and dinner, daily Happy Hour and live entertainment. A local’s favorite! Menus, events, webcams and entertainment calendars can be found on their website. Red Fish specializes in cuisine where a blend of housemade spices, tropical fruits and vegetables are combined with Lowcountry specialties and we are commited to serving our guests the freshest ingredients possible. The restaurant has an extensive wine list; and diners may also browse the on-site wine shop which boasts more than 1,000 bottles to choose from. Lunch: Mon.-Sat. 11:30 a.m.-2 p.m. Early Dining Specials: Nightly 5-5:45 p.m. Dinner: Seven Nights. Serving everything from fresh seafood to delicious steaks, it’s hard not to find something to enjoy and almost impossible to forget the waterfront view. Serving breakfast, lunch and dinner. Home of the O.E.O. Menus, events, webcams and entertainment calendars can be found on their website. A Unique Waterfront Dining Experience Overlooking Hilton Head Island’s Beautiful Jarvis Creek or Famous Harbour Town Marina. The Crazy Crab menu is derived from Lowcountry recipes, and each entree is individually prepared to order. The Alaskan Snow Crab Legs are the best on the Island – winning local awards for multiple years. Come visit and see why The Crazy Crab has been a local favorite for over 30 years! 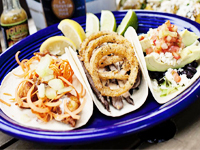 In addition to a broad range of Tex-Mex cuisine, Aunt Chilada’s family-friendly menu also offers excellent seafood, Lowcountry boil, American fare, all-you-can-eat crab legs and more. Feed a houseful with take-out packages for large parties available. Serving 7 days a week starting at 11:30 a.m. 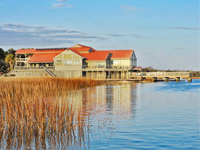 Situated on Broad Creek, the Old Oyster Factory is a delight for family and children of all ages. Enjoy superb, innovative seafood and steaks while taking in one of the Low Country’s best panoramic views of the marshland landscape. 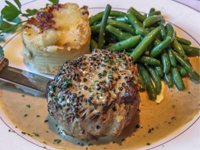 Reilley’s has been serving up delicious steaks, seafood, pasta and sandwiches on Hilton Head Island for 34 years. With a sophisticated warm ambiance Reilley’s is reminiscent of a true Boston pub with a family-friendly atmosphere. Dine indoors or out at our south-end location in Reilley’s Plaza at the Sea Pines circle. Enjoy nightly dinner specials with family, or toasting to the good life with mimosas and champagne Sunday brunch. Lunch and dinner served seven days a week. Happy hour daily at both locations from 4 – 7 p.m., and kids eat free on Tuesdays. The new Fishcamp on Broad Creek offers an extensive menu and boasts views of Broad Creek from the large outdoor patio and covered bar. 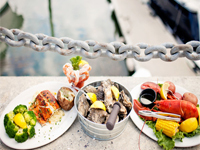 The menu consists of mainly seafood and American cuisine, including steak and lobster. The restaurant is family-friendly and offers games including bocce and corn hole as well as live entertainment. Visit Fishcamp for the amazing food, and learn all about the history Fishcamp and the Native Islanders played in the development of modern-day Hilton Head. Lunch daily from 11am. Dinner from 5pm. Happy hour from 4-6pm daily at the bar. Bar open until midnight. Brunch on Sundays from 11am-2pm. Pet-friendly patio. 11 Simmons Road, Hilton Head Island. 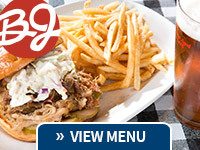 Located at the Robert Trent Jones Golf Course inside of Palmetto Dunes, Big Jim’s BBQ, Burgers & Pizza is the perfect spot for families, golfers, locals and visitors alike to enjoy southern BBQ, juicy burgers and mouth-watering pizza. This relaxed restaurant offers weekday happy hour, eight big screen TVs, an outdoor patio overlooking the golf course, a full bar and a friendly staff. Call 888-322-9091 or visit www.PalmettoDunes.com/big-jims.